Jan Willem van der Hoeven is the founder of different ministries in Israel and Holland. He was born in The Netherlands where his father was private secretary to Queen Juliana. He studied in London where he obtained his Bachelor of Divinity Degree from the London University. Jan Willem has lived in the Middle East for 45 years, and today resides north of Jerusalem in Anatot - home of the biblical prophet Jeremiah. Both his children have served in the Israel Defense Forces. Initially he traveled widely through the Arab world, and later became the Custodian of the Garden Tomb in Jerusalem (1968 - 1975), where he spoke to thousands upon thousands of people at the site of the Empty Tomb. 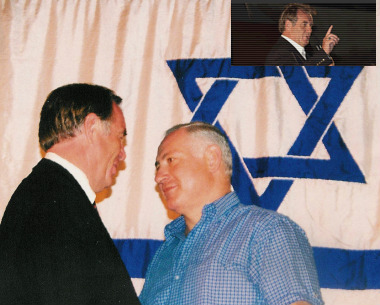 In 1981 Jan Willem founded The International Christian Embassy Jerusalem (ICEJ) where he worked for nearly two decades as spokesman - the Embassy's voice to and on behalf of the people of Israel. Today he is director of The International Christian Zionist Center (ICZC), which has been established to stimulate and activate worldwide Christian interest in, and support for, the State and people of Israel. Other projects initiated by Jan Willem include the 'International Christian Zionist Congress', the 'Mordechai Outcry' for the homecoming of the Soviet Jews to Israel, and, with others, the annual celebration of the 'Feast of Tabernacles', which is held in Jerusalem. Jan Willem has personally met and known the last five prime minister's of Israel, and is acquainted with many leaders, Knesset members and influential institutions in the land. Jan Willem is an inspiring and charismatic man with a deep love for Israel and the Jewish People. As a genuine Middle East specialist, has been a much-requested speaker in churches, synagogues and public meetings all across the world. He has addressed audiences of the AIPAC conferences, the International Congress of the Bnei Brit, the Zionist Organization of America and others. He has also appeared on numerous television and radio talk shows and interviews. Jan Willem is a recipient of the prestigious Louis Brandeis Award from the Zionist Organization of America (ZOA). The International Forum for a United Jerusalem has honored Jan Willem van der Hoeven, by the hands of the prime minister of Israel, Mr. Benjamin Netanyahu (then during his first term in office), with the Guardian of Jerusalem Award for his ceaseless efforts for a united and undivided Jerusalem. Recipients of the Guardian of Jerusalem Award include the Chief Rabbi of Israel, Mr. Meir Lau, the former mayor of Jerusalem, Mr. Teddy Kollek and United States Senator Patrick Moynihan. Jan Willem van der Hoeven is the author of "Babylon or Jerusalem." This prophetic book has been translated into several languages.